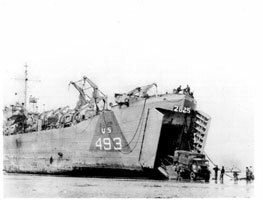 October 4, 1943, LST 493, the 48th ship produced at Evansville, slid into the river and began her journey as one of the many unsung heroes of W.W. II. After arriving at Naval Station New Orleans, Louisiana commissioning began at 1645 on December, 13, 1943. U.S.S. LST 493 was accepted from Lt. Harold I. Josey, USNR, representing the Commandant Eighth Naval District and placed in full Commission by Lt. Francis P. Rossiter, USNR, who assumed command in accordance with orders of U.S.N.A.T.B., Solomons, Maryland dated 12 November 1943. Present at the ceremony were chaplain Lt. (jg.) Ernest D. Kent, USNR, and various officials. The ship's crew reported aboard for duty and were also present at the commissioning ceremonies. For several days provisions were brought on board and the crew began their respective duties. For the next two months ship and crew underwent rigorous training exercises in all facets of amphibious operations. Joint exercises were conducted with other LSTs to reinforce the preliminary training received by most crew members at the Navy's first amphibious assault training base, U.S.N.A.T.B., Solomons, Maryland. All hands practiced beaching the ship, unloading cargo, firing the ship's guns, towing other craft, navigating in shallow water, fire fighting, steering from auxiliary control, launching LCVPs, and myriad other preparatory tasks. Little did anyone know what actually awaited them on the "Far Shore" of Normandy. After long days of painful practice and the loading of significant ammunition, Lt. Rossiter received confidential routing instructions, N.D. 8/37:JCS:sr Serial No. NA-0903 dated 25 January 1944, to proceed from New Orleans to New York, New York. February 1, 0858, the ship got underway steaming on various courses and speeds. As protection against magnetic mines "degaussing coils" were set throughout the voyage. At 2145, February 8, 1944, the 493 entered New York Harbor with a pilot aboard. From this date until February 26 the ship journeyed between Bayonne, New Jersey, Boston, Massachusetts, and finally to Halifax, Nova Scotia. Anticipation was building as many ships joined convoy SC 154 per Secret Sailing Orders and Secret routing instructions proceeding from Halifax to Milford Haven, Wales. Some of the other ships present included Merchant ship SW "San Francisco," M.V. "Bonaire," SS "Ocean Courier," SS "Manchester Spinner," U.S.S. LST 492, and U.S.S. LST 502. Aboard the 493 were also men from the Coast Guard and U.S. Army. Final preparations for sailing included taking on additional provisions, 1500 tons of cargo, and diesel fuel. Observing cruising Condition III, Material Condition X-ray, and establishing black out conditions the convoy got underway, after midnight February 29, 1944. Steaming on base course 077 degrees true, the convoy employed all evasive procedures to avoid enemy vessels. 40mm guns #1,2,6,&7 were fully manned. On March 14, 1944 the convoy entered through the mine nets into the channel leading to Roseneath, Scotland. Ships dropped anchor in Keloreggan anchorage. The next day the convoy ships proceeded on different courses. The 493 traveled to Glasgow. After receiving Secret Sailing Orders S.O. No. 480 issued by Com. 12th Fleet on March 23, the 493 made flank speed underway to Falmouth, England. The trawler Notre Dam de France joined the voyage. A small boat from the trawler came alongside the 493 to discuss rendezvous procedures with other ships and future anchorage points. April 3, Secret Sailing Order Serial No. 216-44 was received from U.S.N.A.A. Falmouth - Cornwall, England. With a revised destination, 493 joined convoy WP501 astern of U.S.S. LST 287 in route to Plymouth, England. At 1934 the ship moored to Trinity Pier, at Great Western docks after entering through the submarine nets at Plymouth Harbor. On Saturday, April 22, 1944 LST 493 became the Group 28 LST Flotilla flagship per Secret letter Serial No. 50-125-44 dated 21 April and Confidential Sailing Order 50E435 from C in C Plymouth, England. Accompanied by U.S.S. 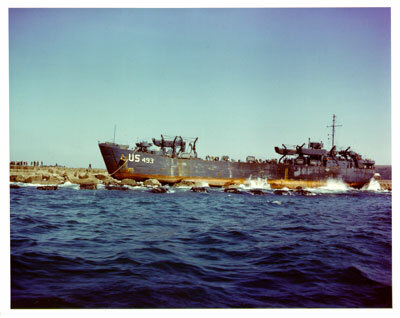 LSTs 17, 30, 47, 264, and 503, the ship joined Task Unit 123.1.1 with L. F. Teuscher, Commander, USN, aboard as C.T.U. At the rendezvous, LSTs 73, 75, 25, 229, and 279 formed into two columns in route to Weymouth. At 2218 the anchor was dropped with other ships in Weymouth Road, Weymouth, England. No bearings or landmarks were available due to total blackout conditions. Several days passed as many other U.S. and British ships dropped anchor near the convoy. April 27, Secret letter 28/A4-3 was received from Commander Group 28 dated 27 April 1944, Serial No. 009. Per orders, the convoy proceeded to The Solent, Isle of Wight, England. LSTs 279, 229, 44, 52, 345, 344, 370, 308, 312, 21, 72, 17, 264, 73, 30, 503, 287, 280, and 25 got underway on various courses and speeds conforming to the channel under Material Condition X-ray, cruising condition III. The 493 passed through the nets to the Solent off the Isle of Wight and let go anchor at 2150. Two days later, 493 got underway and moored at Sugar Two Dock, Southampton, England to take on board 5 officers, 68 enlisted personnel and 32 vehicles of various Royal British Army groups. Included were the 346 Co. RASC Infantry Brigade, 522 Co. RASC Infantry Brigade, 186 Field Ambulance, 8 Durham Lt. Infantry, 9 Durham Lt. Infantry, 25 Lt. A.A.R. Artillery, 120 Lt. A.A.R. Artillery, 102 Anti-tank Battery R. Artillery, 233 Field Co. Royal Engineers, 35 Field Dressing Station, and 980 Squadron 54 B. Flight Balloon Unit. On May 4, the convoy got underway per Top Secret Orders Operation Plan One Letter LST Group 28/A2-11/A4-3 dated May 1, to Hayling Island, England. The 493 was Task Unit Commander for five other LSTs, 344, 308, 287, 30, and 279. All ships were streaming Barrage Balloons on 100 feet of wire rope and were bound for amphibious maneuvers. During May, LST 493 made numerous trips to Southampton to pick up additional equipment, personnel, and provisions. 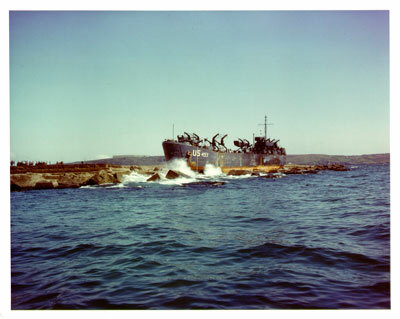 On June 2, while loading more troops and vehicles, LST 52 rammed one anchor fluke into the hull of the 493 while trying to anchor on the starboard side. Fortunately, the 493 crew was able to weld a plate over the one foot hole. The final personnel loaded aboard included 195 officers and enlisted men with 39 vehicles from many groups including the 50th [N] Div Postal Unit 6, HQ 69th Infantry Brigade 2, 8th Battalion DLT 1 & 36, HQ 50th N Div. 1 & 3, 50th Div. Pro Co., 522 Co. RASC 1 & 52, 346 Co. RASC 10, 151 Brig. Signal Section 3, 54 RAF Balloon Unit 2, 4/7 DG 4, RHQW Dgns. 4, 233 Field Co. RE 10, 7 Green Hirounds (? ), 6 DLI 15, and 151 Brig. LAD 11. With the personnel and equipment previously loaded in late April, the 493 was now carrying 268 men and 71 vehicles in addition to the approximate 90 crew members. Over the next three days 493 moved between Southampton and the Solent off the Isle of Wight to receive final food and supplies, check out all ship systems, and calibrate navigation gear in preparation for the invasion. June 5, 1944, at 1921 the 493 deck logs record "Anchor aweigh 1923 Underway at various courses and speeds conforming to channel for the Farshore, operation 'NEPTUNE.'" The final countdown to D-Day had begun! One must remember while history records the gallantry exhibited by most of the servicemen involved in the invasion, it was nothing short of miraculous that the most complex amphibious assault ever conceived was actually triumphant! So many men received so little training to prepare them for the horrible task ahead. Imagine what must have been going through the minds of the sixteen year old troops or sailors who had faked their age so that they could fight for their country. Clark Page, Ensign Gunnery Watch Officer of the 493, stated he often wonders about his grandchildren having to face a similar situation. At the age of 22, he held an awesome responsibility. He also ponders just how so young a group of men handled this overwhelming battle. Despite being so young and having abbreviated training, the crew and ship were heading to France. According to "Operation Neptune: Landings in Normandy, June 1944," each flotilla was assigned a channel leading to the holding area for the five invasion beaches, Utah, Omaha, Gold, Juno, and Sword. A review of the plan reveals the English Channel was laid out like an intricate highway system. It was an elaborate plan timed to the minute for each participant of Operation Neptune. The 493's path would lead to Gold beach, the eastern most beach assigned for British troop landings, for their first landing on the Far Shore. She was underway in accordance with Top Secret Orders No. 1 Serial No. 0005 dated 3 June 1944. On June 6, D-Day, at 1648 the ship anchored finally off the center of Gold Beach, King Sector, Baie de la Seine, France. While the first assault wave hit the beach, the 493 awaited notification to proceed to the shore. Over the next hours many ships were moved from anchorage to anchorage gradually moving closer to shore. While a raging war ensued on the sea, in the air, and certainly on the beaches, wave after wave of landings were executed. Finally, the 493 was directed to the shore and she beached at 1431, June 7, on Gold beach, King Red Sector to offload troops and equipment. By 2130, the ship retracted from the beach and anchored one mile from the H.M.S. Bulolo, British command ship for the 493's battle group. Over the next nine months, the ship and crew made at least 35 landings on the shores of France. Perilous trips between England and France would eventually take its toll. It is hard to believe that with all the victories won in battle, having survived mines, submarines, shore artillery fire, enemy aircraft, buzz bombs, beach obstacles, a 5 foot by 3 inch hole next to the keel, flooded engine compartments, and fires on board, the 493 would finally meet her match one rough night while attempting to enter Plymouth Harbor during blackout conditions! Clark Page, Officer of the Deck, entered these fateful entries on the 493 deck log, April 12, 1945: "0400-0800 Steaming as before on course 030 degrees T and speed 7 knots. At 0400 turned on navigational lights. At 0420 passed "Channel" buoy abeam to starboard at a distance of one mile. This distance was determined by radar. A signal was received from Port War signal station to proceed and anchor close inshore in Jenny Cliff Bay. At 0425 sighted Cawsand buoy bearing 355 degrees T. At 0434 the speed was reduced to 5 knots, and the anchor detail is standing by. At 0436 the gate vessels lights were turned on. Changed course to 020 degrees T. At 0438 passed Cawsand buoy abeam to port at an estimated distance of 1000 yards. The course was changed to 350 degrees T. The radar was reported out of operation. At 0440 received a signal to steer more to westward from breakwater, port signal station. The rudder was put at left standard; then left full. The speed was changed to all engines back full as a shadowy outline of the breakwater was observed. At 0441 grounded on outer breakwater of Plymouth Harbor, England, at a latitude approximately 50 degrees 20' North, longitude 04 degrees 09' West. Lights from a harbor defense ship illuminated the breakwater after grounding. At 0442 port engine ahead full; starboard engine back full; right full rudder in an effort to twist the ship free. Crew called to collision quarters. At 0444 ship began to pound heavily and an urgent message for tugs and assistance was sent by blinker light to port signal station. At 0450 water reported in auxiliary engine room and shaft alleys. Handy Billies were put into operation in an effort to keep ahead of water in flooded spaces. At 0510 lowered #5 small boat so it would be available to handle lines between ship and tug. Water was reported in main engine room. At 0525 tug standing off port side. Lowered #1 small boat. At 0530 secured auxiliary engine room." For the next sixteen hours many tugs attempted to pull the 493 off the rocks but were not successful. During these hours, most of the ship's crew was evacuated to other vessels. A survey of the damage revealed flooded engine rooms, shaft alleys, all fresh water tanks, and two feet of water at the tank deck level. Captain J. D. Shaw, ComLSTPhibCraft12th along with other command officers affirmed the decision to remove all ship's records and crew except a skeleton group. One final effort to float the ship free at high tide was made, but was not successful. At 2015, the decision was made to abandon ship. At 2020, April 12, 1945, Commanding Officer Lt. F.P. Rossiter made the final sad entry in 493's deck log, "All openings were checked so as to prevent further flooding which might jeopardize salvage. The Commanding Officer was last to leave the ship." The ship's crew was assigned to Plymouth Naval Station and was eventually shipped all around the world to other duty assignments. According to accounts from Plymouth residents and some official sources, the 493 was finally salvaged in 1946 for scrap, still hard aground on the outer breakwater. Truly a sad ending for a crew and ship that had given everything to win the war!